// The absolute path to UTStats's home directory. 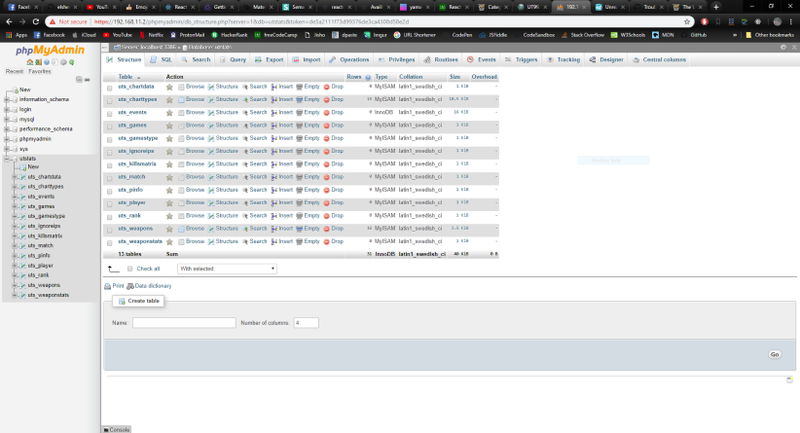 // Use the MySQL temporary tables feature? // No longer supported from UTStats version 4.3 onwards. Left here for historical purposes. $import_use_temporary_tables = false; // DON'T USE IF YOU DON'T KNOW WHAT YOU'RE DOING! // Use temporary heap tables? $import_use_heap_tables = false; // DON'T USE IF YOU DON'T KNOW WHAT YOU'RE DOING! // How to backup logfiles? // Purge old logs after x days. 0 to disable. // After how many seconds should we reload the import page? // the page after the amount of seconds you specify in order to bypass php's time limit. // Ignore bots and bot kills/deaths? // How to deal with banned players? // won't be shown; efficiency etc. will be calculated including these kills though. // Don't import if the gametime was less than x minutes. Set to 0 to import all logs. 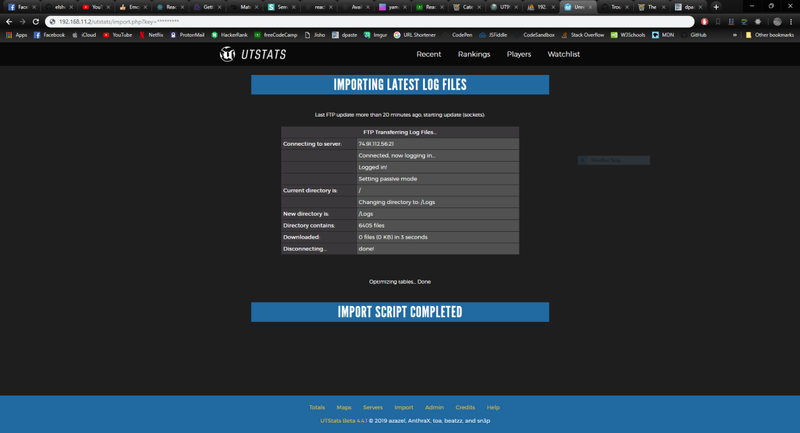 // Enable downloading of UTDC logs? // Purge old UTDC logs after x days. 0 to disable. // Enable downloading of AC logs? // Purge old AnthChecker logs after x days. 0 to disable. // Enable downloading of ACE logs? // Purge old ACE logs after x days. 0 to disable. // Requires GD- and FreeType support. $ftp_type = 'sockets'; // Which FTP module do you want to use? $ftp_passive[$i] = true; // Use passive transfer mode for this connection? $ftp_delete[$i] = true; // Delete logs after download? // UT Server 2 --- Uncomment this one if needed, or copy/paste the block above if more servers are needed. Last edited by beatzz : 18th January, 2019 at 06:04 AM. Connected to remote host "c-74-91-112-56.inap-atlanta.nfoservers.com:21". Waiting for greeting. GET < 331 Password required for ut99. GET < 230 User logged in. GET < 350 Restarting at 100. GET < 257 "/" is current directory. GET < 250 CWD command successful. GET < 257 "/Logs" is current directory. GET < 200 Type set to A. GET < 227 Entering Passive Mode (74,91,112,56,122,170). GET < 125 Data connection already open; Transfer starting. GET < 226 Transfer complete. It's been like 10 days and I have made zero progress on this. Can anyone please help me here?